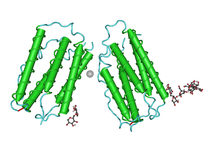 The three-dimensional structure of human interferon beta. The IFN-α proteins are produced mainly by plasmacytoid dendritic cells (pDCs). They are mainly involved in innate immunity against viral infection. The genes responsible for their synthesis come in 13 subtypes that are called IFNA1, IFNA2, IFNA4, IFNA5, IFNA6, IFNA7, IFNA8, IFNA10, IFNA13, IFNA14, IFNA16, IFNA17, IFNA21. These genes are found together in a cluster on chromosome 9. IFN-α is also made synthetically as medication in hairy cell leukemia. The International Nonproprietary Name (INN) for the product is interferon alfa. The recombinant type is interferon alfacon-1. The pegylated types are pegylated interferon alfa-2a and pegylated interferon alfa-2b. IFN-ε, -κ, -τ, and -ζ appear, at this time, to come in a single isoform in humans, IFNK. Only ruminants encode IFN-τ, a variant of IFN-ω. So far, IFN-ζ is only found in mice, while a structural homolog, IFN-δ is found in a diverse array of non-primate and non-rodent placental mammals. Most but not all placental mammals encode functional IFN-ε and IFN-κ genes. IFN-ω, although having only one functional form described to date (IFNW1), has several pseudogenes: IFNWP2, IFNWP4, IFNWP5, IFNWP9, IFNWP15, IFNWP18, and IFNWP19 in humans. Many non-primate placental mammals express multiple IFN-ω subtypes. Not to be confused with Interferon gamma or IFN-γ. IFN-α and IFN-β are secreted by many cell types including lymphocytes (NK cells, B-cells and T-cells), macrophages, fibroblasts, endothelial cells, osteoblasts and others. They stimulate both macrophages and NK cells to elicit an anti-viral response, involving IRF3/IRF7 antiviral pathways, and are also active against tumors. Plasmacytoid dendritic cells have been identified as being the most potent producers of type I IFNs in response to antigen, and have thus been coined natural IFN producing cells. In mice, IFN-β inhibits immune cell production of growth factors, thereby slowing tumor growth, and inhibits other cells from producing vessel producing growth factors, thereby blocking tumor angiogenesis and hindering the tumour from connecting into the blood vessel system. In both mice and human, negative regulation of type I interferon is known to be important. Few endogenous regulators have been found to elicit this important regulatory function, such as SOCS1 and Aryl Hydrocarbon Receptor Interacting Protein (AIP). Piscine (bony fish) type I IFN has been cloned first in zebrafish. and then in many other teleost species including salmon and mandarin fish. With few exceptions, and in stark contrast to avian and especially mammalian IFNs, they are present as single genes (multiple genes are however seen in polyploid fish genomes, possibly arising from whole-genome duplication). Unlike amniote IFN genes, piscine type I IFN genes contain introns, in similar positions as do their orthologs, certain interleukins. Despite this important difference, based on their 3-D structure these piscine IFNs have been assigned as Type I IFNs. While in mammalian species all Type I IFNs bind to a single receptor complex, the different groups of piscine type I IFNs bind to different receptor complexes.. Until now several type I IFNs (IFNa, b, c, d, e, f and h) has been identified in teleost fish with as low as only one subtype in green pufferfish and as many as six subtypes in salmon with an addition of recently identified novel subtype, IFNh in mandarin fish. .
^ Schultz U, Kaspers B, Staeheli P (May 2004). "The interferon system of non-mammalian vertebrates". Developmental and Comparative Immunology. 28 (5): 499–508. doi:10.1016/j.dci.2003.09.009. PMID 15062646. ^ Oritani K, Tomiyama Y (November 2004). "Interferon-zeta/limitin: novel type I interferon that displays a narrow range of biological activity". International Journal of Hematology. 80 (4): 325–31. doi:10.1532/ijh97.04087. PMID 15615256. ^ Hardy MP, Owczarek CM, Jermiin LS, Ejdebäck M, Hertzog PJ (August 2004). "Characterization of the type I interferon locus and identification of novel genes". Genomics. 84 (2): 331–45. doi:10.1016/j.ygeno.2004.03.003. PMID 15233997. ^ Todd S, Naylor SL (July 1992). "New chromosomal mapping assignments for argininosuccinate synthetase pseudogene 1, interferon-beta 3 gene, and the diazepam binding inhibitor gene". Somatic Cell and Molecular Genetics. 18 (4): 381–5. doi:10.1007/BF01235761. PMID 1440058. ^ Zhou Q, Lavorgna A, Bowman M, Hiscott J, Harhaj EW (June 2015). "Aryl Hydrocarbon Receptor Interacting Protein Targets IRF7 to Suppress Antiviral Signaling and the Induction of Type I Interferon". The Journal of Biological Chemistry. 290 (23): 14729–39. doi:10.1074/jbc.M114.633065. PMC 4505538. PMID 25911105. ^ Wang YX, Xu WG, Sun XJ, Chen YZ, Liu XY, Tang H, Jiang CL (November 2004). "Fever of recombinant human interferon-alpha is mediated by opioid domain interaction with opioid receptor inducing prostaglandin E2". Journal of Neuroimmunology. 156 (1–2): 107–12. doi:10.1016/j.jneuroim.2004.07.013. PMID 15465601. ^ Jablonska J, Leschner S, Westphal K, Lienenklaus S, Weiss S (April 2010). "Neutrophils responsive to endogenous IFN-beta regulate tumor angiogenesis and growth in a mouse tumor model". The Journal of Clinical Investigation. 120 (4): 1151–64. doi:10.1172/JCI37223. PMC 2846036. PMID 20237412. Lay summary – Helmholtz Centre for Infection Research. ^ Charoenthongtrakul S, Zhou Q, Shembade N, Harhaj NS, Harhaj EW (July 2011). "Human T cell leukemia virus type 1 Tax inhibits innate antiviral signaling via NF-kappaB-dependent induction of SOCS1". Journal of Virology. 85 (14): 6955–62. doi:10.1128/JVI.00007-11. PMC 3126571. PMID 21593151. ^ Altmann SM, Mellon MT, Distel DL, Kim CH (February 2003). "Molecular and functional analysis of an interferon gene from the zebrafish, Danio rerio". Journal of Virology. 77 (3): 1992–2002. PMC 140984. PMID 12525633. ^ Lutfalla G, Roest Crollius H, Stange-Thomann N, Jaillon O, Mogensen K, Monneron D (July 2003). "Comparative genomic analysis reveals independent expansion of a lineage-specific gene family in vertebrates: the class II cytokine receptors and their ligands in mammals and fish". BMC Genomics. 4 (1): 29. doi:10.1186/1471-2164-4-29. PMC 179897. PMID 12869211. ^ a b Laghari ZA, Chen SN, Li L, Huang B, Gan Z, Zhou Y, Huo HJ, Hou J, Nie P (July 2018). "Functional, signalling and transcriptional differences of three distinct type I IFNs in a perciform fish, the mandarin fish Siniperca chuatsi". Developmental and Comparative Immunology. 84 (1): 94–108. doi:10.1016/j.dci.2018.02.008. PMID 29432791. ^ a b Boudinot P, Langevin C, Secombes CJ, Levraud JP (November 2016). "The Peculiar Characteristics of Fish Type I Interferons". Viruses. 8 (11). doi:10.3390/v8110298. PMC 5127012. PMID 27827855. ^ Hamming OJ, Lutfalla G, Levraud JP, Hartmann R (August 2011). "Crystal structure of Zebrafish interferons I and II reveals conservation of type I interferon structure in vertebrates". Journal of Virology. 85 (16): 8181–7. doi:10.1128/JVI.00521-11. PMC 3147990. PMID 21653665. ^ Aggad D, Mazel M, Boudinot P, Mogensen KE, Hamming OJ, Hartmann R, Kotenko S, Herbomel P, Lutfalla G, Levraud JP (September 2009). "The two groups of zebrafish virus-induced interferons signal via distinct receptors with specific and shared chains". Journal of Immunology. 183 (6): 3924–31. doi:10.4049/jimmunol.0901495. PMID 19717522. This page was last edited on 30 March 2019, at 19:43 (UTC).